As long as you keep the lines of communication flowing with your employer, there should not be room for miscommunication. Speaking with co-workers, family members, friends, boyfriends, girlfriends, church members, and whoever has ears that will listen, does not take the place of you directly communicating your concerns or issues with your employer. When going to outside sources that have no idea about your work ethics, except for what you tell them, could lead you down a very uncomfortable path in the future with your job. 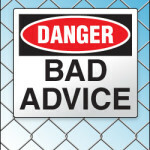 What if they give you the wrong advice? What if their advice leads to your termination? You’ve heard the phrase before: “Watch who you take advice from.” This is so true! What good is it for you to go to cousin Larry who can’t keep a job to save his life but has employment advice for you? Or, why listen to Aunt Sally who hasn’t worked a day in her life and makes suggestions based on what she’s seen on Television or saw or the internet? Rule of Thumb: If you’re in doubt, open your mouth… to your employer! A face-to-face conversation is always the best; this eliminates any misunderstandings in an email message. Too often, an email is received followed by a few others trying to explain what was meant in the first email. If a face-to-face meeting is impossible, a telephone conversation should be the next best thing. Fully express what your issues are and see if there are any resolutions instead of making assumptions. Whether you have a problem with your supervisor, would like to address the possibility of a raise, can’t handle a co-worker, or desire room for advancement; if you don’t express this, how will your employer know? Thanks to technology, effective communication skills have been lost; people rely on hiding behind computers, phones (texting), and other gadgets instead of eye-to-eye or telephone correspondence. Speak directly to your employer pertaining to anything job related; after all, this is who writes your checks… why wouldn’t you want to be clear about things that you have issues with. Don’t take constructive criticism personal. If you are an employee, chances are the company saw something of value in you. Learn from your mistakes and allow them to make you a better worker. Don’t take a critique as an attack. Watch your tone. Yelling or raising your voice at your employer is never the road to travel. Sighing, crossing your arms, and rolling your eyes are almost a guarantee for a short-term career. Here’s something to consider: If you wouldn’t want it done to you, don’t do it to your boss. Have you ever conversed with someone who continuously sighed while you were speaking as a jester to get you to be silent? It was quite annoying wasn’t it? Of course it was. How about having someone roll their eyes at you, cross their arms and raise their voice while you were speaking? That’s outright rude right? Of course it is! Don’t be passive-aggressive. Say what you mean, mean what you say but keep it professional. No need to be a “Yes man” in front of your employer and then five minutes later pout behind his back to your co-workers. If you get whatever problems or questions you have out there in the open, 9 times out of 10, you can avoid having a small issue turn into something huge. Get a clear understanding. Make sure you completely understand what your employer is communicating to you; ask for clarification if you are having difficulties. Leave Co-workers out of the mix. There is enough drama going on in the world alone, leave it out of the workplace as best you can. The “he said, she said” should be over and done with at this stage in your life. The most pleasant thing you can do as an employee is keep your place of employment drama-free! Work on yourself harder than you’ve ever worked on anything else, and you won’t have problems fixing things as they come your way. If you follow these steps outlined above and keep the lines of communication flowing, you are sure to meet success when conversing with your employer. I couldn’t currently have asked for a better blog for the industry. You’re surely a terrific expert in this arena. Thank you for remaining there for folks like me. Came across this post. I am coming back to your site for more information soon, thank you. Lots of quality content here. I simply want to say I’m beginner to blogging and site-building and certainly loved your web site. Probably I’m planning to bookmark your blog post . You definitely come with exceptional article content. Thanks a bunch for revealing your blog. Keep up to date the amazing works guys I’ve included you guys to my blogroll.